Last Thursday night’s approval of AB 60 by both houses of the California Legislature, granting driver’s licenses to illegal aliens, poses a serious threat to the security of all Americans, critics charge. The critics say that in 2005, in response to recommendations by the 9/11 Commission, Congress enacted the REAL ID Act in order to discourage state governments from issuing driver’s licenses and other identity documents to illegal aliens – and that California’s AB 60 is designed to circumvent requirements of REAL ID Act. In an effort to make airport security lines shorter and move faster, the Transportation Security Administration (TSA) will allow passengers to apply for expedited airport screenings. TSA says the plan is for 25 percent of U.S. travelers to be eligible for the system by the end of this year, and 50 percent by 2014. Idaho became the third state to join the Records and Information from DMV’s for E-Verify (RIDE) program on Sunday. The other two states are Mississippi and Florida. RIDE automates motor vehicle document verification between Motor Vehicle Agencies (MVAs) and the United States Citizenship and Immigration Services (USCIS). 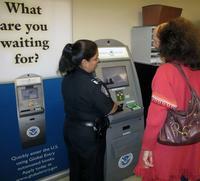 A new system has been introduced to get passengers through airport security faster. The program, called Global Entry, was developed by the Customs and Border Patrol (CBP) and it offers a new way to avoid customs and immigration lines. A bi-partisan group of House lawmakers is working to include a provision in the House immigration legislation which will make it easier to travel to the United States. Travel industry groups support the effort, having fought for years to get the government to relax security measures. The industry has argued that these measures have turned off many foreigners from traveling to the United States.